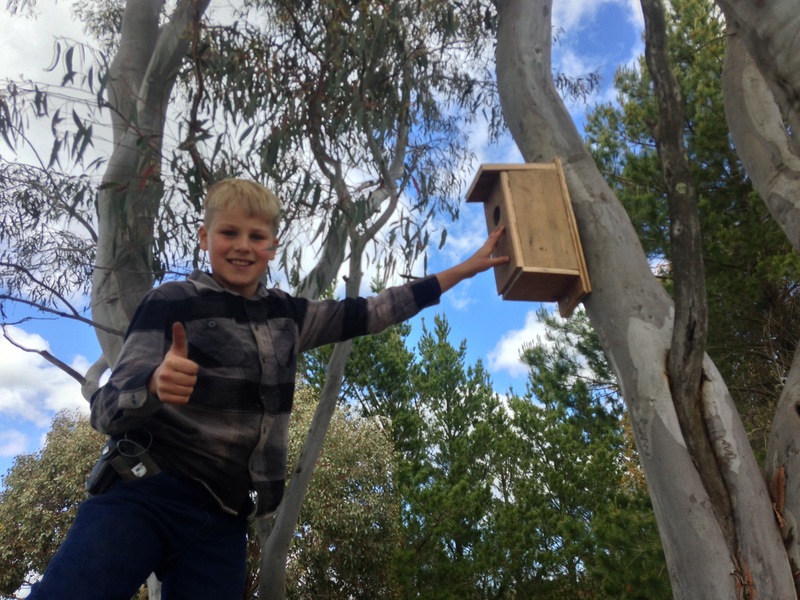 Whilst the Rock Farm is blessed with many hundreds of trees, only a handful of our trees are large old trees, with all important nesting hollows for our native birds. Hollow logs and branches take literally hundreds of years to form – and are prized by native birds for nesting. With our young areas of re-growth promising excellent habitat in the future, we thought we would lend our birds a helping hand. 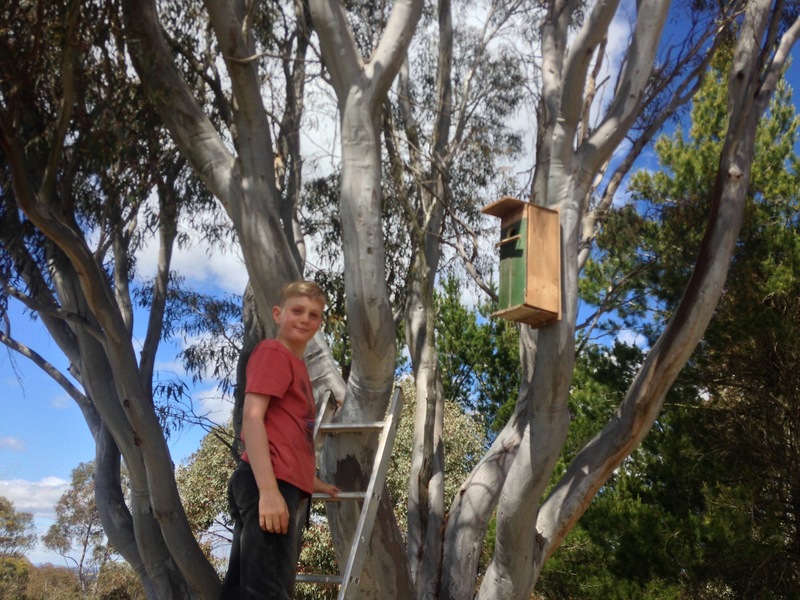 One way to assist native birds, even in an area with as many trees as ours, is to build nesting boxes. They replicate the hollows that take so long to form. There is a wealth of information online, with plans freely available. There is also a significant amount of science involved too, with the size of the box, the entry diameter and other features critical for many species. 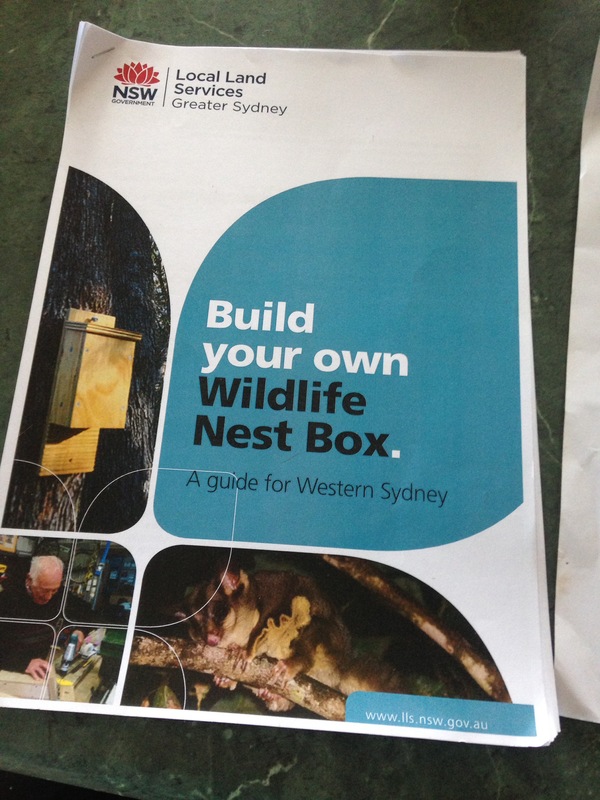 We armed with this excellent publication from the Local Land Services (available online here: http://greatersydney.lls.nsw.gov.au/__data/assets/pdf_file/0006/656610/GS-LLS-Wildlife-Nest-Box-2016_Final-Accessible.pdf). With our heads full of plans and ideas it was time to get building. The boys had a look around the Rock Farm Resource Centre – also known as Dad’s Shed, and we found some old flooring that was looking for a new purpose. This was to be the boy’s own project. In the interests of expediency (I was looking forward to an afternoon nap) I might have cheated and run the timber through the bench saw to cut it, but I was working to their design. The old adage of measure twice and cut once was in force… but soon there was so much pencil lines on the boards it was hard to tell which ones to cut! The boy’s initial thoughts were that this would be easy… but like all good plans, they soon realised that assembling the boxes would take a little effort. I told them they couldn’t use glue – so it was hammer and nails only. The Little Helper found his soft oregon boards were easy to work, but the Little Fisherman regretted his selection of thick hardwood boards. He ended up pre-drilling his holes, and only broke one drill bit in the process. To their credit, I only was used to hold things together a couple of times. The bench saw made small adjustments easy and before long we had a couple of neat little boxes ready to hang in the trees. The best way to secure the boxes to the trees is via two bugle headed screws. This causes far less damage to the tree than tying wire around the branch. We mounted the boxes in a Scribbly Gum (Eucalyptus Haemastoma). We are just now waiting for our first guests to move in! It was a wonderful way to spend a morning with my gorgeous boys. They learnt a few new skills, and as a bonus, we get to help a few little birds get a head start. One of the reasons we moved to the Rock Farm was to ensure our kids have a well rounded understanding of our food supply chain. One part of this food chain includes the raising of sheep for meat. 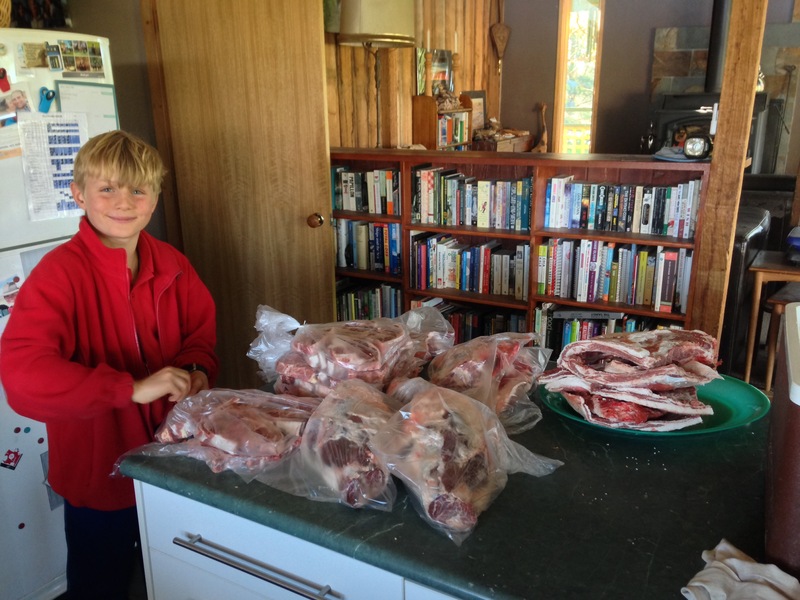 And whilst we could sell our sheep through the regular sale yards, and buy our meat from a butcher, I think we have a responsibility to teach our kids about what meat production actually involves. By slaughtering the lamb ourselves, we reduce the stress on the animal significantly and save on food miles. I appreciate that many people may feel uncomfortable with this process, and indeed many people make the choice not to eat meat at all. I understand and respect those choices. But I also feel that meat production often gets an unfair portrayal. We are told it is bad for the environment, however I know that the Rock Farm has an incredible range of biodiversity that you don’t find on mono-culture cropping farms. 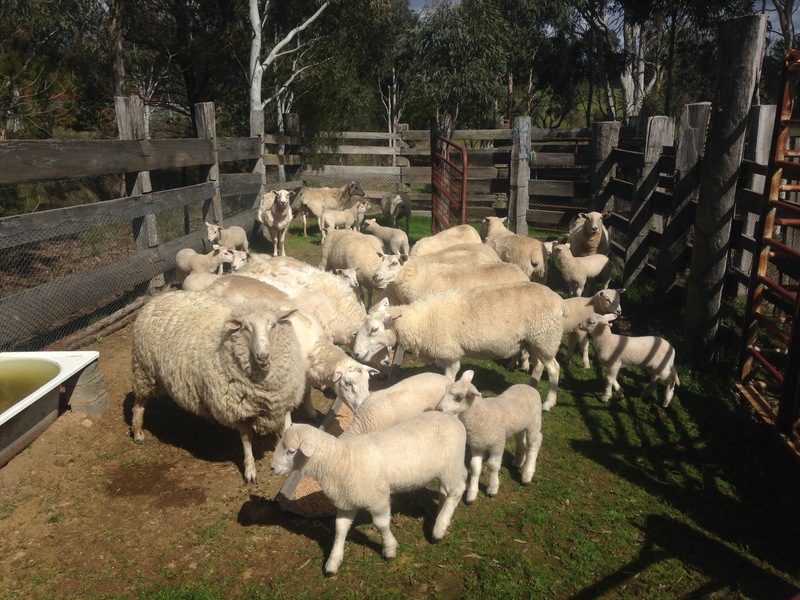 We have hundreds of native animals, lizards and birds, native grasses, shrubs and trees that live in harmony with our small scale sheep production. I also know that all who raise animals have a social responsibility to ensure the stock are raised in a humane, healthy manner. I see small scale poly-culture or permaculture that works with the natural environment as being our future. 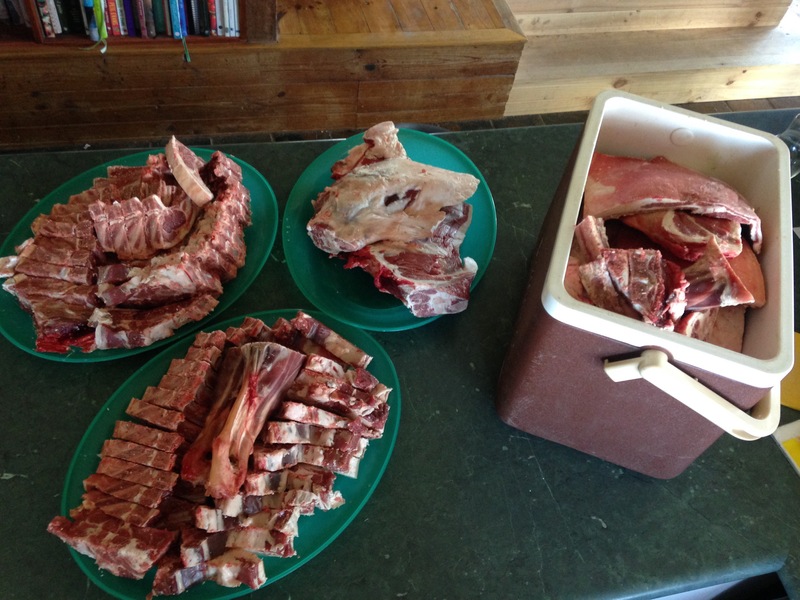 Butchering a lamb is a skill, and it had been many years since I had last butchered a couple of lambs. I found a few moments to enjoy a cup of coffee refreshing myself with the excellent words of John Seymour in his Self Sufficiency guide. 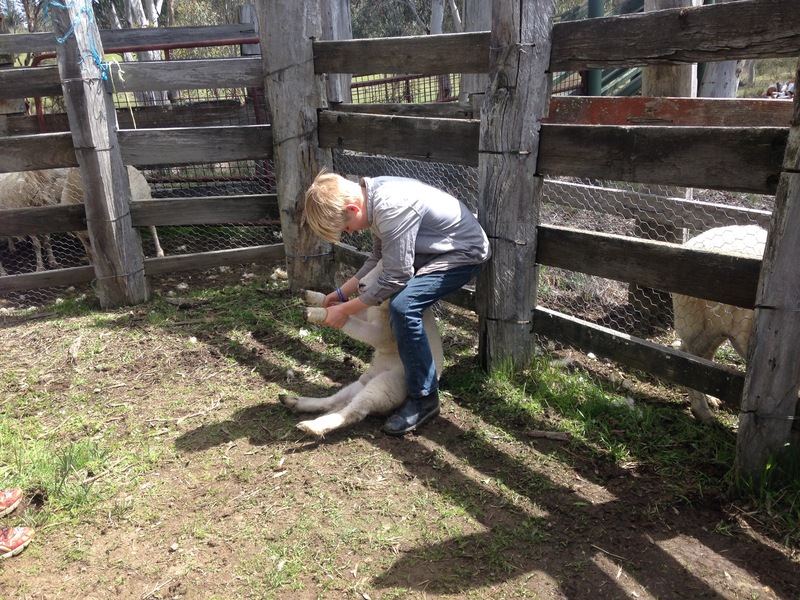 The first thing to do with the lamb was to shear him. Thankfully friends down the road kindly agreed to shear the lamb, and also give the Little Fisherman a lesson in shearing. This is definitely something I cannot do, but Jimmy made it look easy. 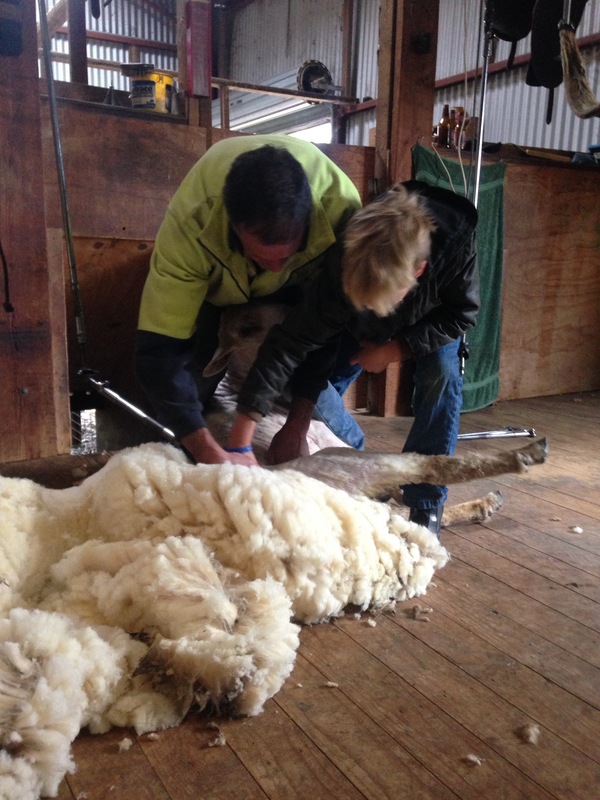 After shearing, it was important to slaughter the lamb quickly and humanely. Again I learnt from Jimmy, who after many years has perfected the skills of cleanly slaughtering and butchering sheep. The principles were as described in John Seymour’s book, however Jimmy was unbelievably quick and in no time at all we had skinned and cleaned the carcass. We then hung the carcass in a cool room for 10 days, before running it through a band-saw. With the legs and shoulders making great roasts, we cut most of the rest into chops. It took under ten minutes to turn the carcass into meals. It was then a relatively simple process to divide the meat into meal size portions for the freezer. The dog also managed to do extremely well out of the offcuts. 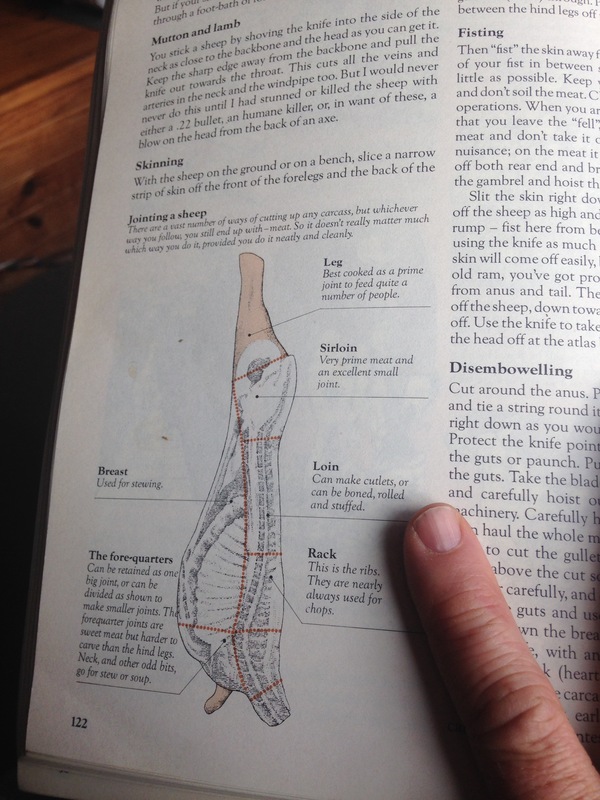 There are few rules that apply to home butchering in NSW. The basic premise is that meat that is butchered at home is not able to leave the property. You are not able to sell, swap or barter it, or even give it to family and friends. This is to protect us all from disease and parasites that used to be common place in yesteryear. Making sure the meat is well cooked is a good start, but you also need to wash your hands frequently, make sure you dispose the offal properly and keep vaccinations and dog worming up to date. A huge thank you to Jimmy for his guidance, and patience in bringing me back up to speed. It was much appreciated. With The Rock Farm’s new lambs quickly growing, we had a well timed visit from the cousins to help with marking duties. Marking was our first opportunity to check on the health and welfare of the lambs. Marking is when you give the lambs their all important vaccinations, place an ear tag in their ear and dock their tails. As an added bonus the boys are also castrated. As our sheep shed their wool, we don’t need to mules them, however we do need to check for fly strike. Can you pick the odd one out? One fellow here is a first cross lamb from last spring. 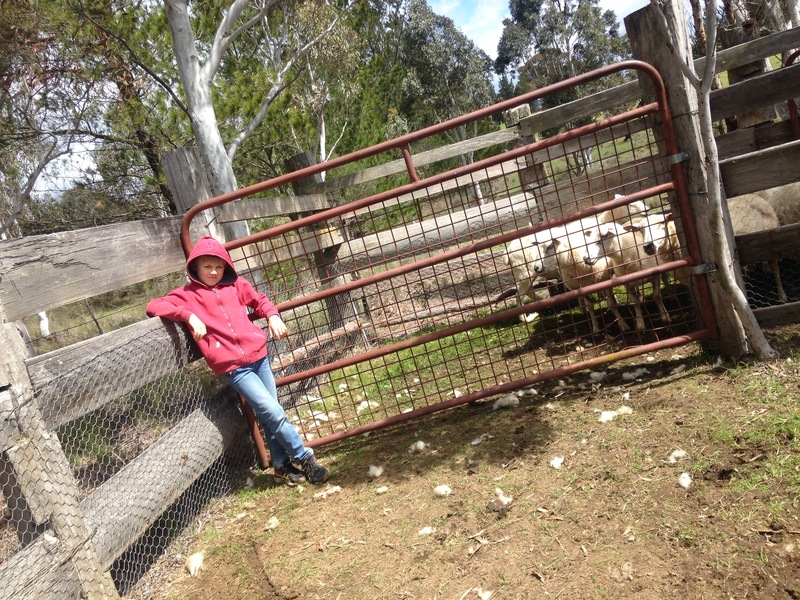 With a bucket of feed, and a couple of kids on foot, the sheep were soon mustered in the yards. The advantages of teaching them to come when called and to follow a bucket (bucket mustering) is worth it for the ease and stress free nature of mustering, for both man and beast. It has been a while since I have marked lambs, and then never many at once. A firm believer in learning from the collective knowledge of those gone before, I had a quick read through the excellent NSW DPI handbooks (http://www.dpi.nsw.gov.au/content/agriculture/livestock/sheep) and the Producers Guide to Sheep Husbandry Practices published by the Meat and Livestock Association (ww.makingmorefromsheep.com.au/_literature_129885/Sheep_Husbandry_Practices). It was time to get the job done. The ewes look on anxiously whilst we take care of their babies. My main aim when marking is like any farmer. To make the process as quick and painless as possible. 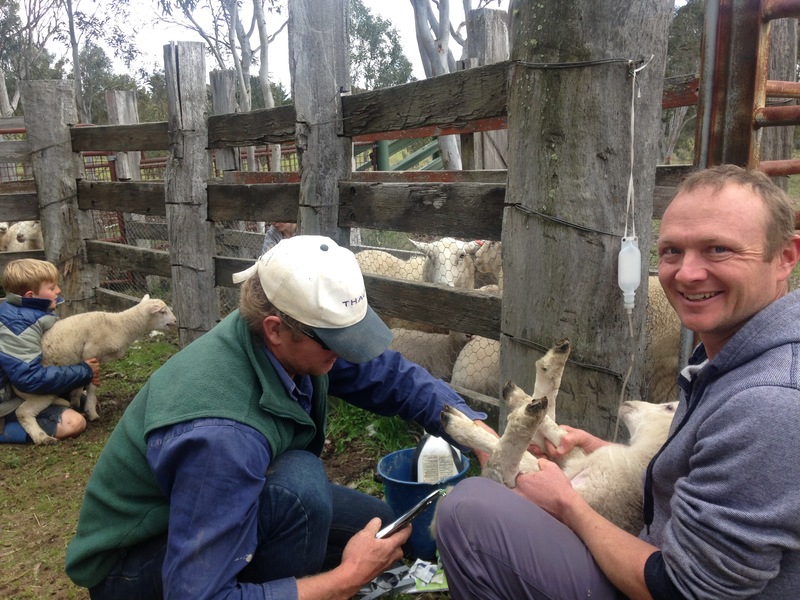 We used lamb marking rubber rings to castrate the males and dock their tails. These rings essentially cut off circulation to the relevant bits. I think it is more humane than the older methods that used a knife to achieve the same aim. With such small numbers of animals, we adapted an old set of cattle yards for our purposes. A run of chicken wire effectively secured them in the yards. 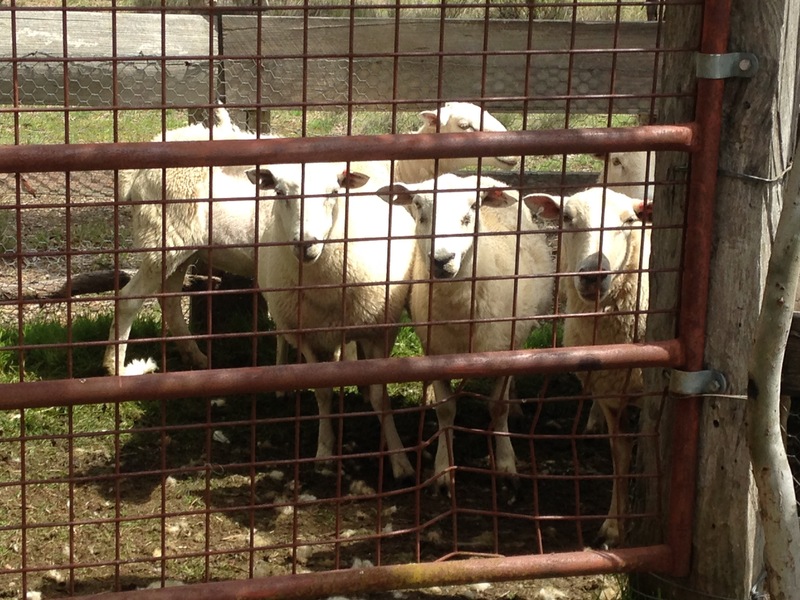 One of the cousins was employed as gate keeper, allowing only caught lambs into the main yard for marking. He also took turns at catching lambs. Lambs will sit quietly if held sitting upright. With no cradle to hold the lambs, my brother kindly offered his services. You will note that The Little Fisherman has it sorted in the photo above, unlike the The Little Helper in the photo below who didn’t hold on to his lamb properly. As a result he was having a bit of fun holding on to it whilst it waited its turn. Marking is usually the first opportunity to confirm lamb numbers. Out of our 14 ewes, we had 16 lambs, with an even split of boys and girls. We had lost one ewe and one lamb a few weeks earlier. Despite this loss, I was really pleased with the overall result. Healthy happy sheep. The ear tags are all marked with our unique Property Identification Code (PIC). This means that all sheep that leave our property can be traced back to The Rock Farm on the National Lifestock Identification System database. Each year a new colour ear tag is applied, to allow quick identification of the animal’s age. For 2016 lambs, the colour is black. To prove the sheep held no grudges, I turned up with a bucket the next day in the paddock, and they all came running, despite the green grass of Spring. They will get another vaccination booster in four weeks or so, and then they will be good to turn grass into meat!